The tornado devastated areas from Mississippi's central western border with Louisiana northeastward to Alabama. Massive cleanup efforts got under way Monday after several tornadoes ripped through the South, killing at least 12 people - 10 in Mississippi - and leaving a swath of devastation in the region, from Louisiana to Alabama. A 3-month-old baby and two other children were among the fatalities. Dozens more were injured, and scores of homes leveled. 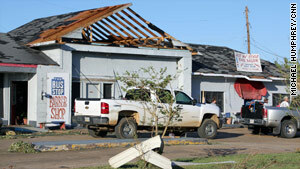 The tornado devastated neighborhoods from Mississippi's central western border with Louisiana northeastward to Alabama. It sheared roofs off houses, overturned cars, snapped hundreds of trees and plunged large parts of the state in darkness as it toppled power lines. Five of the dead were from Choctaw County in north-central Mississippi; four were from Yazoo County, north of Jackson; and one was from Holmes County, also in north-central Mississippi, said spokesman Greg Flynn of the Mississippi Emergency Management Agency. This is so sad, especially when children are killed which makes it even more painful to read. May their young souls RIP and the adults that tragically died as well. My prayers go out to everyone that suffered from this tragic event.